A lot of banks offer what they call “courtesy overdraft protection.” On the surface it seems like a good program. After all, they do cover the bad check you wrote, right? Actually, most “courtesy” overdraft protections can end up putting you in a worse situation than just dealing with a returned check. Most courtesy overdraft programs work in a very straightforward fashion. If you write a check that exceeds your account balance, they’ll cover that check for you, but it will cost you. First of all, the bank will ding you with a fee of varying size. A common number that I’ve seen is $35 – most initial fees are somewhere in that range. After that, you’re typically charged a daily fee until you come up with the cash to bring your account to a positive balance. This can range from $2 to $10 a day, depending on the bank. Let’s call it a $5 average. So, let’s say you had a $50 check returned and you couldn’t cover it for five days until payday. You’d be hit with an initial fee of $35, plus $25 for the daily fees. You’re paying $60 in fees just to cover a $50 check! Even worse, a few overdraft protection plans charge you a monthly fee on your account, ranging from $1 to $3. My recommendation is usually to opt out of these plans, even if you’re not getting dinged with a monthly fee. 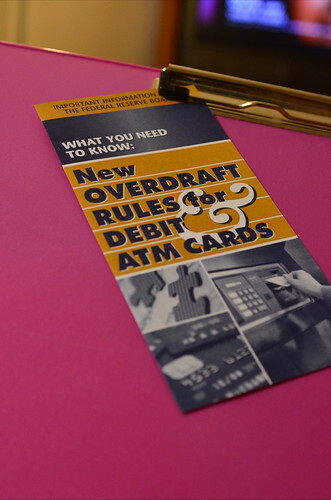 Obviously, you’ll need to examine the exact fees charged by your bank, but almost always the consequences of “courtesy” overdraft protection are worse than a normal overdraft. First of all, the financial pain of an actual overdraft has a strong likelihood of being less painful than the overdraft protection. The bank will often just return the check and charge you a small fee, leaving the resolution to the business you passed the false check to. That bank fee is usually smaller than the courtesy overdraft initial fee, but you’ll want to check to make sure. Furthermore, if you’re not a serial overdrafter, you can usually resolve the consequences of the bad check with a phone call or a visit along with an apology. Simply contact the business you wrote the check to, apologize for your banking mistake, and pledge to make it right. If they have a returned check fee (some businesses do), ask for it to be waived. As always, if a business treats you well, reward it later with good word-of-mouth (as we want good businesses to thrive and customer-unfriendly businesses to die out). I haven’t been close to an overdraft for a long time, thankfully. I’m very careful with my balances and leave a nice buffer in place. Even given that, I took the time to remove courtesy overdraft protection from my account. If I mess up, I’m quite sure that it will cost me far less to resolve the check on my own than letting the bank ding me hard for my mistake.